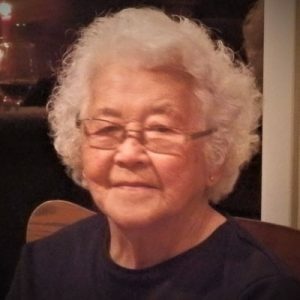 Born on October 7, 1922, lifelong Kelowna resident Shizue Hayashi passed away on January 29, 2019 at the age of 96. She is survived by her daughters: Joyce Favell (Don), Pegi Uyeyama (Joe) and Gail Brown (David); grandchildren: Staci, Maya, Bobbi, Jackson, Lindsay, Kelsey, Robin, Andrew, Hayley and Nathan; great-grandchildren: Josh, Keisa, Sarah, Michiko, Kaya and Quinn; and sisters-in-law Shirley Yamaoka and Eileen Yamaoka. Shizue is predeceased by husband Katsuzo, son George and daughter-in-law Irene, brothers Iwamatsu, Kiyomatsu, Shuo and Toshio, and parents Iwajiro and Okiku. A Funeral Service will be held on Monday, February 11, 2019 at 7:00 pm at the Kelowna Buddhist Temple, 1089 Borden Avenue, Kelowna, with Reverend Miyakawa officiating. The service for HAYASHI, Shizue is scheduled for Monday, February 11, 2019 at 7:00 pm. Below you will find the map for the service location and the contact information should you have any questions. My warmest condolences to the entire Hayashi family. Pegi, thanks for sending me this, as we are in Palm Springs and may not have heard. Losing a mom is very hard, the pain will stay with you forever but will lessen in time. Hugs and Love From Gayle (Jones) Lauman and Harold Lauman. So sorry to hear about your mom’s passing. She was a doll! My condolences go out to you and all the Hayashi family. Dear Joyce, Peggy, Gail and family, we are so sorry to hear of your mom’s passing. It was a few weeks ago that we saw your mom at the store and it was so nice to have a little chat with her. Our thoughts are with you during this time. My deepest condolences Mrs. Hayashi will always be remembered as a kind & gentle lady. I had the very great pleasure and privilege of working with Shiz many years ago at Purdys in Orchard Park Mall. I will always remember her tinkling laugh and sweet smile and how just her presence made the work better. I offer my sincerest sympathies to all of her family and hopes that the wonderful memories of her that you share help you in the days ahead. Joyce, Pegi, Gail and families Deepest sympathy to you all.. Your mother was a Grand Lady of Kelowna!